A spoon is a utensil used when cooking, serving and eating food. Several different types of spoons are used for different tasks when eating and serving food. While the common household might not differentiate between each type, they are commonly used in restaurants throughout the world. Knowing the difference between different types of food utensils can save embarrassment when presented with an array of choices. Serving spoons in particular all have different uses at the dining table; there are even different spoons for both sugar and salt. The common serving spoon is used to serve fruits, vegetables, salads and other commodities found at the dining table. It is round in shape with a deep bowl to take up food easily; the handle is long to allow serving across a small distance. The table spoon is similar to the serving spoon, with a long handle made for serving food over a distance. The large bowl of the table spoon is shallow and oval in shape. The table spoon is used to serve specific foods such as mashed potatoes or casseroles. The salt spoon is a miniature spoon with a short handle and a shallow oval bowl. It is typically paired with a salt bowl or cellar at the dining table. The salt spoon is specifically used to sprinkle salt onto food while never coming into contact with the food. The sugar spoon is slightly larger than the salt spoon with a short handle and a bowl classically molded from a sea shell. The sugar spoon accompanies the sugar bowl or basin, and is used for scooping sugar into drinks and onto desserts while never coming into contact with the food. The wooden spoon, as its name implies, is made of wood and used for preparation and stirring of delicate and natural foods. It is believed that metal can taint the taste of delicate foods, so a wooden spoon is often used as an alternative. Wooden spoons are typically the shape of serving spoons and table spoons. 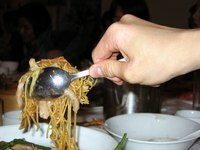 A stirrer is a long utensil with a small bowl or knob on the end, typically provided to each guest at a dining table. The stirrer is used to mix sugar into drinks such as lemonade and tea. A larger version of the stirrer found in the kitchen is commonly used to stir delicate soups as not to damage the ingredients. Mum flowers are divided into different kinds according to the placement, size and shape of their petals. How to Set a Table: Where Do the Plates, Forks, Spoons, Etc. Go? What Is the Difference in Red Wines?